Thank you, Mort Sahl . . . In the early Fifties, Berkeley’s Telegraph Avenue bars and coffee houses were free theaters where, for the price of a drink, you could linger into the early morning hours listening to a succession of world class monologists. My favourites included an aging Trotskyite with the mellifluous voice of a vintage radio announcer, a decadent Viennese scholar who came on like Karl Kraus on steroids, and an unemployed pianist who could hold you spellbound with an illustrated lecture on the evolution of the sonata allegro form. My usual hangout was Robbie’s, which was always buzzing ‘til three or four in the morning. In 1953 a new voice appeared that made Lucky’s Waiting for Godot monolog sound like a haiku. Its owner could, and did, take off from any topic you put to him, building rhetorical edifices that proliferated endlessly in Gaudian splendour. His girl friend persuaded him to audition for Enrico Banducci, who had taken over a bar/night club in San Francisco, the hungry i. 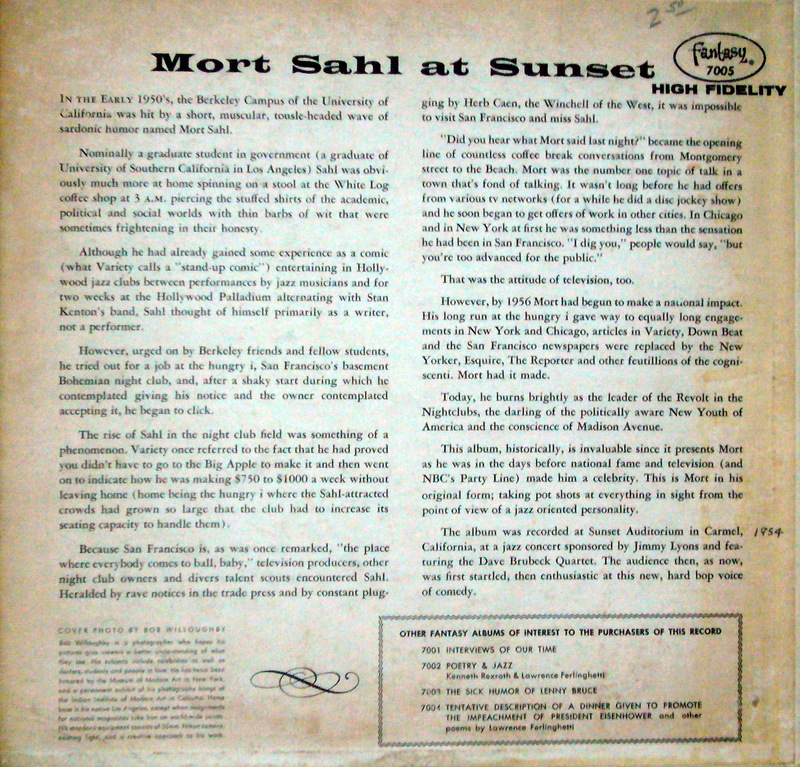 Thus was Berkeley’s own Mort Sahl launched on his meteoric career. At first they didn’t know what to make of him—an intellectual comic was an oxymoron. One of my vivid memories is of a heckler who kept interrupting. Finally Mort stopped and let him talk himself out. Then he set out in a totally different direction: "You know, this wasn't always a night club. In fact, it used to be a basement flat and I actually lived here. Over there was the living room, that was the bedroom and—excuse me, sir, would you stand up, please?—right there was the toilet." After he’d been discovered by Herb Caen, Mort took off into the stratosphere, but well before he became a celebrity I sometimes rode over with him in his clapped-out Jag Mark V. He never stopped talking. On the way he’d pick up the evening Examiner from a newspaper dispenser and leave it folded on the seat beside him. He didn’t look at it until he went on stage, whereupon he opened it up and took off from a headline like Charlie Parker chasing a fugitive melody. I’d sit through the evening’s shows, wondering what he was going to say next—no two were ever the same. Then we’d pile into the Jag and head back across the bay to Kip’s, an all-night hamburger joint on Bancroft just below Telegraph. All the way back and on into the morning, three a.m. or later, he never stopped talking. His monolog was as seamless and as endless as the Ring Cycle, its familiar leitmotivs weaving in and out of the structure—Ike, Nixon, Joe McCarthy, the FBI, the DAR. All those up-tight right-wingers who made the political, intellectual and artistic life in Fifties America a tightrope walk over an abyss became larger-than-life caricatures on Mort’s colorful canvas. 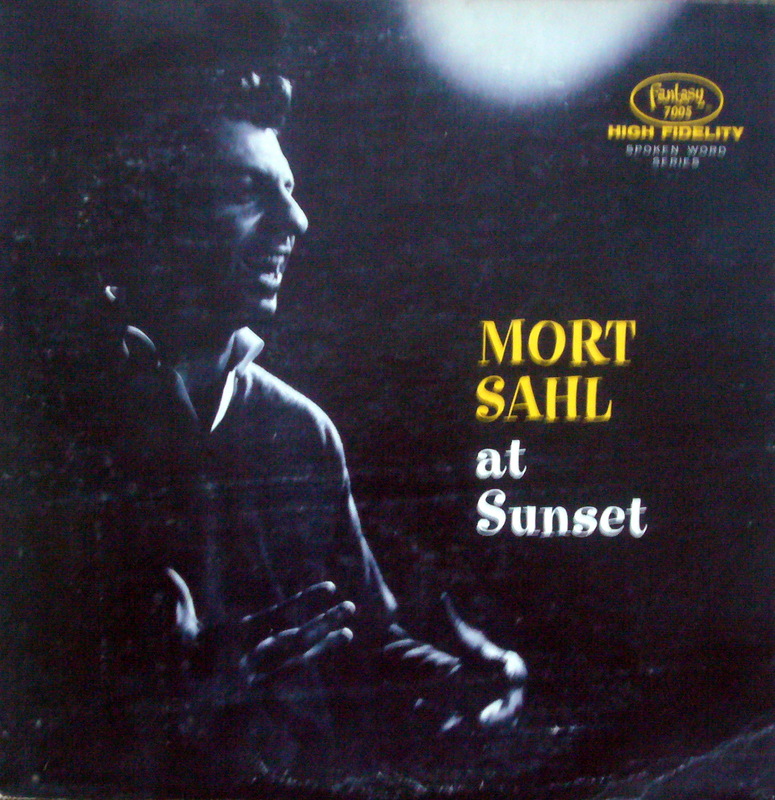 Mort Sahl at Sunset was not the first of his records to be released, but it was the first to be recorded. He was taped in 1955 at the Sunset Auditorium in Carmel, California at a jazz concert featuring Dave Brubeck (who wa s a couple of years ahead of me at College of the Pacific, but that’s another story). 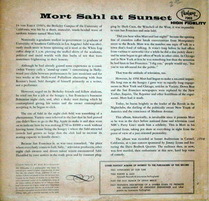 Mort’s own website calls it a “red vinyl rarity”—fortunately, I bought my copy long before it became a collector’s item. Listening to it today, it’s impossible to imagine audiences across America lining up in their thousands to listen to such mind-stretching stream-of-consciousness free association. He’s perhaps the only man who ever lived who could have been (and was) an intimate friend of Adlai Stevenson, Jack Kennedy and Ronald Reagan. Since the album is impossible to get hold of, I’ve reproduced it HERE. It includes two of my favourite riffs: (1) A bank robber comes up against an intellectual teller, to whom he hands a note that says "act normal." The teller writes back, "define your terms." (2) Mort goes to a poetry reading at Stanford U at which Truman Capote falls out after totally wasting himself with the climactic line, “long thin blades of green grass”, and is carried back to the limo by his minders. 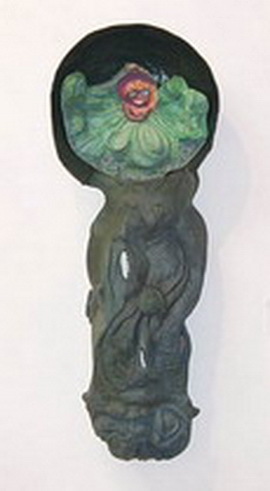 Chris Koch, who less than a decade later was to give me life-altering employment at KPFA [see My KPFA: A historical footnote], was also in Berkeley in 1953 and responded in much the same way to what was going on before our eyes and ears. It’s impossible that we were not, at one time or another, sitting within chatting distance of each other! Chris has generously given permission to include his own Mort Sahl reminiscences—they’re HERE. 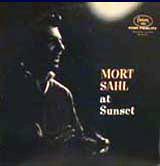 The Official Mort Sahl website. Mort Sahl interviewed by Terry Gross, NPR December 2003. 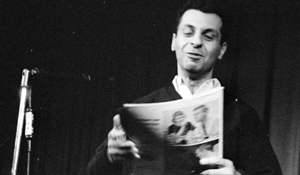 50th anniversary of his first appearance at the hungry i.
Mort Sahl invented stand-up comedy — so what’s he doing at a community theatre in Northern California? National Post, Tristin Hopper | May 25, 2015. A terrific recent article with loads of long video clips.